Knuckles' Chaotix prototype 0111 for the Sega 32X was released by drx during the February 23rd, 2008 proto release. Its compile date is Jan 12, 1995. If you skip past the title screen intro there will be no background in the mode select screen. This is the first version with the 'low res' zoomed in like title screen background. No, it's not actually zoomed in; you can clearly see that it has been low-res-ified. look at the pointy things above the green glowy things in both; you can see it's more than a simple zooming issue. 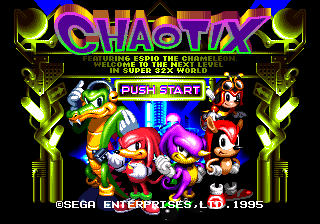 The US region title screen contains the text "Featuring Espio the Chameleon" indicating that at this point Espio was considered the star. Debug mode is still enabled. You can get a negative score in this proto. No limit for Negative Rings. Once collecting an item box, its icon does not appear at the bottom; however, they still seem to work for the most part. Once you pass the combi-catcher part of the level hub you can go back instead of it being locked off, however it just shows up blank. Time Attack messes up the screen but you can still see the characters spinning. The glitch character Wechidna's sprites are messed up. He has a fully functional flying ability, to fly up hold the C button and hold up, works with down as well. To clarify on Wechidna's flying, he acts just like Tails would. For example, after you fly around he gets "tired" and shows a different animation. Another thing to note about Wechidna is that his separate arm sprite doesn't exist. Door Into Summer has a different mix than the final. Tribute in the final is ??? GOOD ENDING ??? in the prototype, indicating that Tribute was to be used instead of Just Another Day. The proto mix is quite different from the final mix. Destructive Power in the final is ??? NORMAL ENDING??? in the prototype. While the final plays three notes on the FM1 (three bass notes that run behind everything), the proto only plays one, which is always one note higher than where the final currently is. Just Another Day in the final is ??? STAFF ROLL ??? in the proto, indicating that the staff roll would originally be separated from the ending scene. There are differences in the drumming. Proto is missing DECISION 2ND. Steel Heart doesn't play, it just plays one note and then stops in proto. Decision keeps looping in final, but only stops after two loops in proto. Oriental Legend, High Five, Reach The Goal, Have a Happy Day, Nice Meeting You, Surprise!, Chaotic World, Tachy Touch, Silver Screen, Pendulum, Soda Pop, Child's Song, Crystal Nightmare, Tube Panic, Mechanical Dance and Surging Power have a different mix. Most of them are different because the PSG 3 held "note" is a much higher one, making them vastly different. When you begin scenario selection you see Knuckles and Espio fall in, however once you touch the ground Espio disappears. Unable to skip past training. The demo after the intro stage forces itself on you, you can't press start to skip it. Act 2 uses Crystal Nightmare as music, Act 3 uses Tachy Touch, Act 4 uses Electoria and Act 5 doesn't play anything. Everything after Act 1 is a blank screen with music, or in act 5's case, nothing. Special stages require 0 spheres to win. Bonus Stage starts you off with 1000 rings for some reason. Once you pass a special stage you get a "Holy ring"
Instead of playing the "Chaotic World" during the stage select roulette it plays the song "Decision".